Rent Creekside of Los Gatos | Corporate Events | Wedding Locations, Event Spaces and Party Venues. 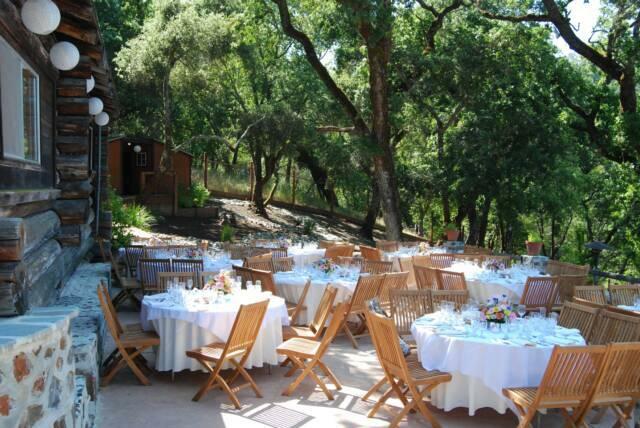 We invite you to schedule a tour of this amazing Los Gatos/Santa Cruz Mountain event venue and see how we can help you complete your vision. Conveniently located near a main highway, CreekSide of Los Gatos is totally secluded. A private tree lined driveway welcomes visitors onto the grounds, a gently sloping hillside surrounded by coastal oaks. Tucked between unspoiled hills and a forested stream, this exclusive haven feels oh-so-close to nature. The bridal suite is a 100+ year old cabin (newly renovated) with picture-scapes of its own. There are at least three ceremony sites on the property, with several ways to setup the reception dining and dancing area. From the outdoor fireplace to the timber arches and the creatively appointed bathroom facilities, all the amenities have been constructed with elegance and comfort for your guests.